What kinds of specialized tools could E-Textile practitioners use? Being an interdisciplinary trade, many tools of our trade come from either electrical engineering or textile practices. Can we imagine and build unique tools that would fulfill needs unique to the practice of E-Textiles? I am torn between “Tools”, “Sustainable E-Textiles” and “Making my tech and wearing it too”. But I think I can distill my interests in these three topics into one idea: I’m interested in thinking about building tools for e-textiles that are themselves e-textile and to have at integrating a power solution that is not a battery or mains power, but maybe solar, movement or heat. The reason for my interest in these topics comes in part because I’ve started building some tools for myself that allow me to be more mobile in my practice (Wearable Studio). Plus, Irene has been doing some really nice work building custom probes for the multimeter! In addition all that, depending on the tool, it could be a nice opportunity to design it to be partially or fully knit on the machines. This topic became a strong research focus of mine in the past months. As Hannah mentioned I am working on custom multimeter probes, but also experimenting with the set of tools that are suitable for our discipline as opposed to “textiles”, “electronics” or the many other fields we draw inspiration from. 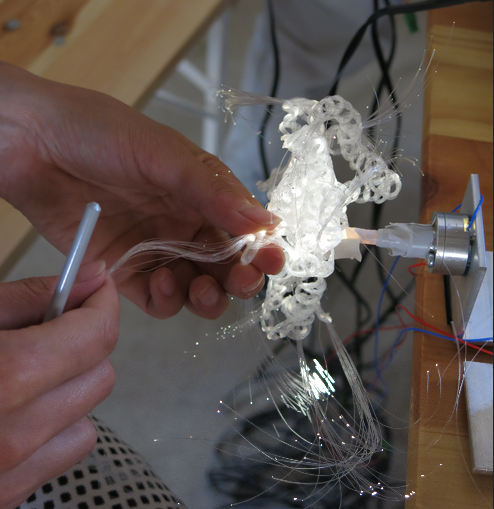 With these prototypes I’m interested to reflect on e-textile practices and the conditions that bring them into being – and eventually build them into “real tools” to use. It is really nice to meet you professional e-textile artists here. looking forward to the multimeter and hannah’s works there! Right now My project is to make circuits on fabric by handweaving method, I work with aboriginal people and use their existed skills, this project is not advance by the technique or the functionality, but to create a communication between modern society and handcraft worker group, conductive materials, programming skills act as a medium in the project, this is what I am interested in. Regarding to material, I’m experienmenting with transparent film speaker, it’s a ready product from a Korea company, maybe it can be useful for this workshop? we are merging “Go small, go wireless” into this group, so i am joining this group. i recently worked with ESP8266 chips, and would be interested to figure out more what and how to do things with chips like that.